Royal Road Productions appreciates your support. If you’d like to support a project or would like information on project budgets, please send an inquiry to [email protected], or make a donation online. Karyn Levitt is the the champion of a neglected but extraordinary German repertoire: the songs of Brecht and Eisler in English translation by legendary drama critic, playwright, cabaret singer, and world authority on Bertolt Brecht, Eric Bentley. She is writing a book, which is part memoire part handbook, posing a central question: how to get the message of a song across? The answer has to do with everything Levitt has learned from studying at the feet of the master and from her experience and explorations over the last eight years. Singers interested in successfully putting across songs in translation will benefit from her experience, training, scholarly approach, and insights. As theatre legend Eric Bentley entered his 100th year in September 2015, Royal Road Productions produced a centennial tribute in his honor, which we also filmed and will soon release. Michael Riedel emceed the historic evening, which featured the participation of Tony Kushner, Austin Pendleton, Louise Kerz Hirschfeld, theatre historian and president of The Al Hirschfeld Foundation; Roger Copeland; Michael Paller; as well as James Shapiro, Edward Mendelson, and Phillip Lopate of Columbia University. The participants offered readings from Eric Bentley's classic works and shared their thoughts about Bentley’s influence on them personally and on American theater, music, and culture. 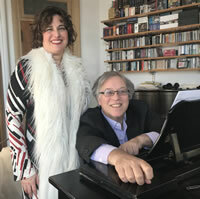 Eisler-Brecht songs were performed along the way in English versions by Eric Bentley by Karyn Levitt with pianist Eric Ostling and The Hanns Eisler Trio. Songs for Mother Courage with music by Darius Milhaud in its original, unpublished orchestration for 14 chamber instruments and words by Bertolt Brecht in English versions by Eric Bentley, received its world premiere by Karyn Levitt with the Metamorphosis Chamber Orchestra conducted by the late, great, four-time Emmy winner, Glen Roven, to whose honor the film is being dedicated. Songs for Mother Courage features music by Darius Milhaud in its original, unpublished orchestration for 14 chamber instruments and words by Bertolt Brecht in English versions by Eric Bentley. on Thursday, March 31st, 2016 at 7PM was a huge success. Our spectacular and historic HAPPY BIRTHDAY ERIC BENTLEY! A CENTENNIAL TRIBUTE CONCERT at Town Hall will soon be a film for screenings on arts channels! 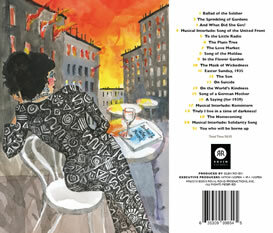 “My Brecht Eisler Song Book has been around for years, finding its way into innumerable schools and homes. This success has not been reflected in the record business until now when Karyn Levitt and Eric Ostling have chosen to record a program based on my book...To parts of this program, to celebrate my 100th year, Karyn and Eric will add Songs for Mother Courage by Darius Milhaud. 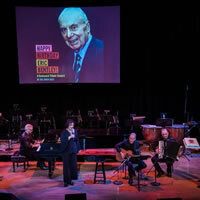 Under Bentley’s guidance, Levitt and pianist Eric Ostling created an evening of Eisler's songs that has earned rave reviews around the country with Irving Wardle of the London Times raving “Karyn Levitt is doing something which, to my ears, is new. My acquaintance with the Eisler songs is limited to (other) singers (who have) a harsh and urgent style, very much a product of the cruel and dangerous times in which the work first appeared. Ms. Levitt's approach, it seems to me, is to negotiate a passage for these songs into the concert hall. In place of the gritty style, she allows them to bloom and be beautiful." 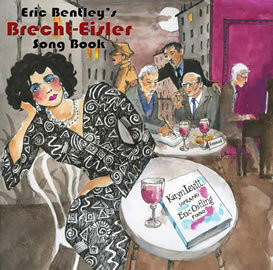 The set list for “Eric Bentley’s Brecht-Eisler Songbook features 21 tracks, half of which have never before been recorded.